We’d love your help. Let us know what’s wrong with this preview of Escape - The Adventures of Max McCannor by Lyndon Perry. 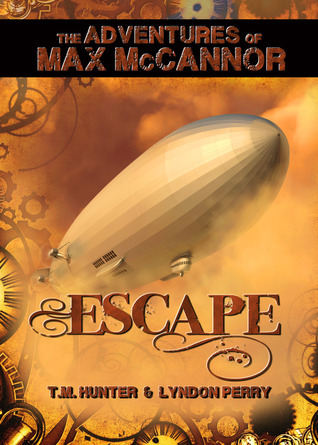 To ask other readers questions about Escape - The Adventures of Max McCannor, please sign up. After Max McCannor’s father departs for California to seek new markets for his inventions, leaving Max in the care of his grandparents, a tragic accident lands Max in the New York Charitable Orphanage for Wayward Boys and Girls. This institution is even less hospitable than it sounds, and after several years of cruel abuse from its caretakers, Max plots an escape, planning to make his way to Chicago and the home of his Aunt Maggie, his only remaining relative, whom he hopes will provide safe hav After Max McCannor’s father departs for California to seek new markets for his inventions, leaving Max in the care of his grandparents, a tragic accident lands Max in the New York Charitable Orphanage for Wayward Boys and Girls. This institution is even less hospitable than it sounds, and after several years of cruel abuse from its caretakers, Max plots an escape, planning to make his way to Chicago and the home of his Aunt Maggie, his only remaining relative, whom he hopes will provide safe haven and some clues to his father’s whereabouts. Max and his friends break out of the orphanage and begin their desperate journey to find his long-lost father, dodging the local authorities and running afoul of a thug in the pay of the orphanage keepers along the way. A few narrow escapes later, they find themselves in an explosive showdown aboard a dirigible bound for Chicago. Will they make it to safety? Even if they survive, will they be captured and sent back to the orphanage? Is there any hope Max’s father is still alive? Escape, by T.M. Hunter and Lyndon Perry, is the first book in their series, The Adventures of Max McCannor, where we meet Max, his friends, and his enemies, and are drawn into his quest. The story quickly sets the stage and drops a few hints that this isn’t quite the history of Victorian-era America we know. It moves at a brisk clip without minimizing the hardships Max and his friends endure at the orphanage, nor the greater dangers they face after their escape. Max quickly steps into the leadership role for his group, though not without a few challenges along the way—and his adventure has only just begun. Some details of the technology are a little hazy—the orphans manage to accidentally start up a disused steam-powered generator without stoking a coal-fired boiler or other visible heat source, and there are some lift-to-weight problems inherent in using a steam engine to power an airship (not to mention the hazard of igniting the lifting gas). There have been small steam-driven airships in our world, so a larger one’s not unreasonable given some differences in physics or technology in this alternate Earth, and I expect more information will emerge in later episodes. Anyhow, part of a steampunk story’s fun is the plethora of rococo steam- and clockwork-powered gadgetry spawned by mad science somehow gone right, and paying too much attention to how it all might or might not work in real life isn’t really the point. Escape, by T.M. Hunter and Lyndon Perry, is an engaging steampunk tale. It begins the story of Max McCannor, a fifteen-year-old boy who decides that no matter what, he is going to find his missing father, and who ends up taking several of his friends along for the ride. The book lives up to its premise well, and the storytelling is also quite good. I found it quite easy to follow, and the pace is decent also. I couldn't skim for even a page, because every detail and line of dialogue is important to the plot. The characters, though not overly-developed, are realistic and believable, and the same can be said for the dangerous situations they find themselves in. The book is written on a level that seems to appeal primarily to preteen or teenage audiences, probably about ten to sixteen years of age, and contains no material which parents would find inappropriate for children in the aforementioned age bracket. There is slight violence, but the worst of it occurs when one character is shot in the shoulder, and there is only minimal blood in that scene. Lyndon Perry is a pastor, husband, and grateful father of two. He enjoys dark roast coffee, herds cats on the side, and used to teach middle grade English. He also runs Tule Fog Press at www.TuleFogPress.com, an indie publisher helping readers and authors find each other in various genres, including mystery, thriller, fantasy, science fiction, and more.